Trisuli is one of Nepal’s most popular rafting rivers; easy access from Kathmandu and Pokhara, scenic valleys and impressive gorges, exhilarating rapids and easier sections and the right amount of time all contribute to its popularity. 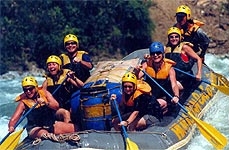 It’s easy accessibility and easy rafting makes it one of the most popular rivers among river runners. A tow day trip or a three-day trip can be combined by a trip to Chitwan national Park. A two-day Monsoon high-water trip starting at Malekhu and taking out at Gaighat is a classic river experience.You run all the good rapids, following the river through its middle stage watch it grow as its tributaries join, marvel as it cuts its way through impressive gorges, then leave it as it spills over the lowlands. From Malekhu, swift torrents carry us through exciting rapids and beautiful canyons. Our rafts crash through towering waves and holes, and there’s time to cruise and explore on our 80km journey to Gaighat. High Monsoon flows provide plenty of exhilaration. Where we start rafting the river is confined to the narrow valleys and gorges of the middle hills, and two days rafting downstream brings us to where the valley opens out to the lowlands. What is raftingRafting is cruising down a gushing river in an inflated rubber raft overcoming rapids and waves that comes crashing on you. It is what we call ‘enjoying life’A Day on RaftWe are woken by the cheerful sound of the birds along with the sun daring you to challenge for yet another day of rapids. After a hearty breakfast prepared by our staffs, we start rafting. We paddle through the high and lows of the rapids and stop in between to scout the rapids as well as to capture these beautiful moments on pictures. We stop for a leisurely lunch break around the middle of the day along the sandy beach of the river. We explore the various temples and villages, waterfalls and other interesting sights. The length of time spent rafting each day depends on our choice of spectacular campsites. Typically we are on the water for 4-6 hours. Camping on isolated sweeping white sandy beaches and sleeping in tents under the stars and open sky is an ideal introduction to the great outdoors.Points to ponder1.Always follow what the river guide tells you and respect his judgements.2.Valuables of any nature should be left at the hotel.3. Shorts, T-shirts, comfortable shoes and a spare pair of clothes to change, sun creams, sun hats and sun glasses, which can be tied at the back, are recommended. 4. Life jackets and safety helmets are a must. 5. Should anyone fall into the rapids, do not panic. Try to float on your back with the feet downstream. Hold on to your paddle, which will make you more visible. Gifted with a multitude of rivers that that are perennially fed by the Himalayas, Nepal is one of the richest countries in water resources. In recent years avid river runners have taken notice of the true potential of the Himalayan river and within a short span of time it is earning a reputation as one of the best places in the world for white water rafting. Though only ten rivers have been opened by the Government for commercial rafting, Nepal offers a unique opportunity for all to taste the thrill of whitewater rafting. There is something for everyone – slow moving rivers with idyllic sand beaches ideal for relaxation to high action big volume rapids that has your adrenaline pumping. Spectacular scenery, rich culture and spectacular rivers make the trip gratifying. Teamwork is crucial to the success of any true adventure. The guidance and instruction of our staff enables you to play an active role in paddling your raft successfully through exhilarating whitewater. From rigging the rafts in the morning to putting up the tents and cooking, you are totally involved in the adventure. Most trips include a layover day when people can wander to nearby villages, explore, learn to kayak, play volleyball, or just relax on a sunny beach with a book, a chance to do as much or as little as you wish. The pace of the trips is very relaxed, we have plenty of time for rest, exploration and discovery. We put a lot of time and effort into preparing superb, hygienically prepared, wholesome and abundant food, as rafting promotes a healthy appetite. We encourage everyone to learn the art of camp cooking, and most people enjoy the opportunity to be involved. We always offer a vegetarian option and can cater to special diets. Trekking means a walking trip following the trails that meander through the rugged terrain in the company of the guide. A rewarding holiday in every sense a typical trek passes through rustic hamlets, terraced paddy fields, past towering peaks. Away from civilization and modern amenities life has changed little in the hills and mountains of Nepal. It is as though time has come to a complete standstill in this part of the world. A trek in these regions is travel back into time and a unique opportunity to catch a peek into the Nepalese way of life from very close quarters. Many of the trekking routes offer indescribable views and the glimpse into unexplored vistas. Pauses at the villages that dot the trail grant a trekker a unique opportunity to immerse oneself in the surrounding. As different people inhabit the different parts of the trail the landscape, the houses, the people and the lifestyle of the people undergo a dramatic transformation with every climb. The experience is culturally exhilarating. Opened to the world only a few decades ago Nepal still preserves its sanctity and is free from the trappings of modern day life, though there are a few exceptions like Kathmandu. The hilly terrain and the lack of roads make sure that the mode of transportation is the most trusted and the oldest, that is on foot. The majority of Nepalese people like our forefathers have been making our way from one place to another on the well-worn trails that snake through the hills slopes. Trekking in Nepal means a walking trip following the trails that meander through the rugged terrain in the company of the Sherpas. A rewarding holiday in every sense. 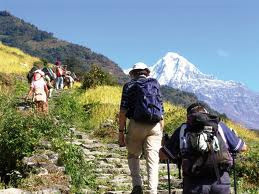 Trekking in Nepal does not require climbing experience. Anyone with sound health and love of nature can go on a trek. Though the trek might require navigating steep hills and climbing down to lower elevations you can set up your own pace and need not wear yourself out. All the Mila Adventure treks are tailor made keeping in mind every aspect. The preservation of the fragile eco system is of utmost importance to us and our support staff led by the sirdar (guide) is made well aware of the significance of preserving the environment. We provide full service tented treks led by highly trained guides with knowledge on Nepalese culture and high altitude survival skills. We take pride in the high quality of service we render – personalized, professional and above all enjoyable. Our crew with a keen sense of hospitality will make your holiday worthwhile. You will make friends with our tour leader during the trip and find adventure that you will re-live for the rest of your life.